The Royal Swedish Academy of Sciences awards the Nobel Prize in Physics, the Nobel Prize in Chemistry, and the Nobel Memorial Prize in Economic Sciences; the Nobel Assembly at Karolinska Institutet awards the Nobel Prize in Physiology or Medicine; the Swedish Academy grants the Nobel Prize in Literature; and the Nobel Peace Prize is awarded not by a Swedish organisation but by the Norwegian Nobel Committee. 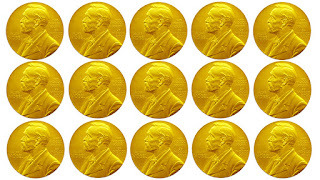 Red cross are win the 3 times Nobel prize :: 1917 , 1944 , 1963). The following are the Nobel laureates who were Indian citizens.at the time they were awarded the Nobel Prize. The following are Nobel laureates born in India or who are Indian origin but subsequently non-citizens of India; however, they are still often included in lists of Indian Nobel laureates. NOTE : : One Year Three Members to Give the Nobel Prize in the Same Field.